Berberine (BBR), an isoquinoline alkaloid derived from plants, is widely used as an anti-inflammatory remedy in traditional Chinese medicine. 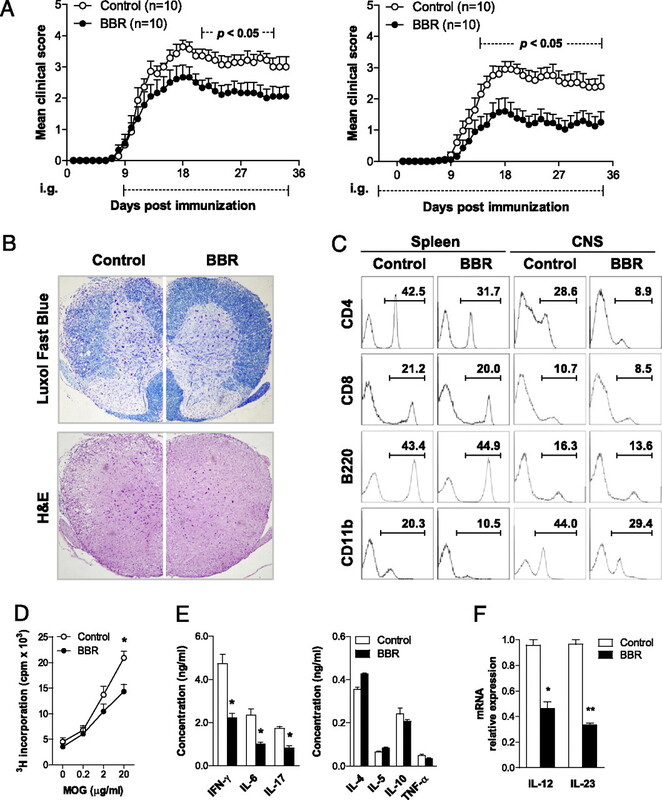 In this study, we showed that BBR was efficacious in the amelioration of experimental autoimmune encephalomyelitis (EAE) through novel regulatory mechanisms involving pathogenic Th1 and Th17 cells. BBR inhibited differentiation of Th17 cells and, to a lesser degree, Th1 cells through direct actions on the JAK/STAT pathway, whereas it had no effect on the relative number of CD4+Foxp3+ regulatory T cells. In addition, BBR indirectly influenced Th17 and Th1 cell functions through its effect on the expression and function of costimulatory molecules and the production of IL-6, which was attributable to the inhibition of NF-κB activity in CD11b+ APCs. BBR treatment completely abolished the encephalitogenicity of MOG35–55-reactive Th17 cells in an adoptive transfer EAE model, and the same treatment significantly inhibited the ability of MOG35–55-reactive Th1 cells to induce EAE. This study provides new evidence that natural compounds, such as BBR, are of great value in the search for novel anti-inflammatory agents and therapeutic targets for autoimmune diseases. Aberrant autoreactive T cell responses, combined with dysfunction of the regulatory network of the immune system, play a crucial role in human autoimmune pathologies, such as multiple sclerosis (MS) (1), which is a chronic inflammatory and demyelinating disease of the CNS. Autoreactive pathogenic Th cells (e.g., Th1 and Th17 cells) are critically involved in the disease pathogenesis of MS and its animal model, experimental autoimmune encephalomyelitis (EAE) (2–7). Th1 cells secreting IFN-γ are closely associated with the clinical severity of EAE and could independently induce EAE when adoptively transferred into naive mice (8). Th17 cells recently identified as a distinct CD4+ T cell subset are capable of mediating CNS pathology of EAE (9–11). Th1 and Th17 cells are able to recruit other inflammatory cells into CNS lesions through the production of multiple proinflammatory cytokines (e.g., IL-1β, IL-2, IFN-γ, IL-17A, IL-17F, and GM-CSF) (12). Further evidence demonstrates that neutralization of IL-17 or inhibition of Th17 cells led to amelioration of EAE, whereas adoptive transfer of Th17 cells directly induced severe EAE in mice (13–17). Differentiation and function of Th1 and Th17 cells is regulated through a complex network of cytokines and transcription factors. The JAK/STAT pathway is one of the major signaling pathways that regulates Th1 and Th17 cell differentiation and their functions (18). Specifically, STAT1 and STAT4 are important members of the JAK/STAT family involved in Th1 differentiation and are activated through JAK2 and Tyk2 following IL-12 stimulation (19, 20). In contrast, STAT3 is a key signaling molecule essential for Th17 lineage commitment and is activated by IL-6 and IL-23 (21–23). The actions of these STAT-signaling molecules are mediated through T-bet for STAT1 and STAT4 and RORγt for STAT3 (24–26). It is well established that APCs are critical for the full activation of T cells by Ag presentation through the tricomplex of MHC, Ag, and TCR and the expression and function of costimulatory molecules, such as CD80, CD86, and programmed death-ligand 1 (PD-L1) (27). These costimulatory molecules interact with corresponding ligands on Th1 and Th17 cells to provide a complete signal that is required for full action of T cells (9, 28). In addition, proinflammatory cytokines, such as IL-12 and IL-6, secreted by APCs are crucial for the differentiation of Th1 and Th17 cells, because they are potent activators of STATs that are critically required for T cell lineage differentiation (16, 29). Current disease-modifying treatments for MS include IFN-β, a humanized VLA-4 Ab, and copolymer-I, a random polymer of four amino acids appearing frequently in myelin basic protein (30). However, these treatments have marginal efficacy or significant safety concerns. The search for new drugs that specifically target pathogenic Th1 and Th17 cells, while sparing other immune cells, including CD4+CD25+Foxp3+ regulatory T cells, is important for the development of more effective MS treatment. Recently, there has been growing interest in exploring novel anti-inflammatory or immunomodulatory drugs from the herbal collection of traditional Chinese medicine. Chinese herbal medicines represent a rich source of natural compounds for the identification of agents of novel mechanism of action and for probing novel targets involved in the inflammatory process. Berberine (BBR), an alkaloid derived from Chinese goldthread (bark of cork tree), has been used for the treatment of various conditions, such as diarrhea and other gastrointestinal disorders, for centuries in China, although its mechanism of action remains undefined (31). It also exhibits antitumor, antimicrobial, and even antidiabetic effects (31–36). Moreover, a recent report suggested that BBR may be efficacious in experimental type I diabetes (37), raising the possibility of its use as a treatment for autoimmune diseases. This study was undertaken to investigate the novel regulatory properties and underlying mechanism of BBR in an autoimmune disease model. The treatment efficacy of BBR in EAE made it possible to identify the cell types and molecular pathways susceptible to the regulatory actions induced by BBR. This study provides novel regulatory mechanism for the treatment of autoimmune conditions and has important implication in the treatment of human autoimmune disease. BBR hydrochloride was obtained from Sigma-Aldrich (St. Louis, MO). The resulting compound used in this study had a purity of 99% and was dissolved in DMSO to provide stock solution. Male C57BL/6 strain (B6) mice were obtained from the Shanghai Laboratory Animal Center, Chinese Academy of Sciences, Shanghai. MOG-specific TCR transgenic B6 mice (2D2) were obtained from The Jackson Laboratory (Bar Harbor, ME), through a materials transfer agreement with Harvard University. Mice (6–8 wk) were immunized s.c. with a synthetic peptide (300 μg) derived from myelin oligodendrocyte glycoprotein (MOG) residues 35–55, whose sequence was Met-Glu-Val-Gly-Trp-Tyr-Arg-Ser-Pro-Phe-Ser-Arg-Val-Val-His-Leu-Tyr-Arg-Asn-Gly-Lys, and which displayed a purity >95% (GL Biochem, Shanghai, China). Immunization was performed by mixing MOG peptide in CFA containing 5 mg/ml heat-killed H37Ra strain of Mycobacterium tuberculosis (Difco Laboratories, Detroit, MI). Pertussis toxin (200 ng; List Biological Laboratories, Campbell, CA) in PBS was administered i.v. on the day of immunization and 48 h later. Mice were examined daily and scored for disease severity using the standard scale: 0, no clinical signs; 1, limp tail; 2, paraparesis (weakness, incomplete paralysis of one or two hind limbs); 3, paraplegia (complete paralysis of two hind limbs); 4, paraplegia with forelimb weakness or paralysis; and 5, moribund or death. For treatment, BBR or vehicle (ddH2O) was administered intragastrically at 200 mg/kg daily, starting from 3 d before (prevention) or 9 d after (treatment) immunization and continuing thereafter. For adoptive-transfer EAE, purified CD4+ T cells from 2D2 EAE mice were cultured in the presence or absence of BBR under Th17- or Th1-polarizing conditions. The resulting cell blasts (6 × 106 cells/mouse) were adoptively transferred into irradiated (400 rad) B6 recipients. The recipient mice also received pertussis toxin (200 ng/mouse) i.v. on the day of immunization and 2 d later. Mice were kept in a conventional, pathogen-free facility at the Institute of Health Sciences. All animal procedures were approved by the institutional review board of the Institute of Health Sciences. Spinal cords for histological analysis were removed from mice and immediately fixed in 4% paraformaldehyde. Paraffin-embedded 5–10-μm sections of spinal cord were stained with H&E or Luxol fast blue and then examined by light microscopy. For purification of infiltrating mononuclear cells (MNCs) from spinal cord and brain (referred to as CNS hereafter), mice were perfused with 30 ml PBS via the heart to eliminate peripheral blood. Single-cell suspensions were prepared, and MNCs were purified using a Percoll (GE Healthcare, Piscataway, NJ) gradient (70/37%), as described previously. CD4+ T cells or CD11b+ cells were purified from lymphocytes by MACS (Miltenyi Biotec, Auburn, CA). The purity of the CD4+ T cell and CD11b+ cell fractions was always >95%. Splenocytes (5 × 105 per well) derived from EAE mice were stimulated with the MOG35–55 peptide for up to 72 h. For assessment of BBR cytotoxicity, MOG-stimulated splenocyte cultures were cultured with different concentrations of BBR for 2 d before determination of cell viability by CellTiter-Glo luminescent assay (Promega, Madison, WI). For T cell and APC coculture assays, MACS-purified CD4+ cells from BBR-treated or control mice were cocultured with purified CD11b+ cells from BBR-treated or control EAE mice at a ratio of 1:3 and were subsequently stimulated with MOG peptide for 72 h. CD11b+ APCs were purified from vehicle- or BBR (5 μM)-pretreated splenocytes. The resulting cells were cocultured with CD4+ T cells at a ratio of 3:1 in the presence of MOG peptide (20 μg/ml) for 72 h. In a parallel experiment, rIL-6 (1 ng/ml) was added to the culture. [3H]Thymidine incorporation during the last 18 h of culture was determined by β-counter (PerkinElmer, Wellesley, MA). Culture supernatants of MOG-reactive T cells were collected 48 h later and evaluated for IFN-γ, IL-17, IL-6, TNF-α, IL-4, IL-5, or IL-10 production using ELISA kits (R&D Systems, Minneapolis, MN), according to the manufacturer’s instructions. MACS-purified CD4+ T cells were isolated from spleen of naive B6 mice or 2D2 mice and were stimulated with plate-bound anti-CD3 and soluble anti-CD28 Abs under Th17-polarizing conditions (10 ng/ml IL-6, 5 ng/ml TGF-β, plus 10 μg/ml anti–IFN-γ and anti–IL-4) or Th1-polarizing conditions (10 ng/ml IL-12 and 10 μg/ml anti–IL-4) in the presence or absence of BBR. Separately, CD4+ T cells were cultured under polarizing conditions in the presence of irradiated CD11b+ APCs pretreated with BBR. For surface-marker staining, cells were incubated with fluorochrome-conjugated Abs to CD4, CD8, B220, PD-1, ICOS, CD11b, PD-L1, CD80, and CD86 (BD Biosciences, San Jose, CA) at the recommended dilution or isotype control Abs for 30 min on ice. For the CTLA-4 staining, cells were fixed and permeabilized with Cytofix/Cytoperm buffer and then stained with CTLA-4 mAbs (BD Biosciences, San Jose, CA). To analyze MOG-specific Th1 and Th17 cells, splenocytes or CNS-infiltrating MNCs were stimulated with 20 μg/ml MOG peptide for 24 h, followed by stimulation with 50 ng/ml PMA and 500 ng/ml ionomycin in the presence of GolgiPlug for 5 h. For intracellular staining of IL-6, cells were cultured with 100 ng/ml recombinant mouse IFN-γ for 2 h and subsequently stimulated with 1 μg/ml LPS in the presence of GolgiPlug overnight. Cells were surface stained with mAbs against CD4 or CD11b. Then the cells were washed, fixed, and permeabilized with Cytofix/Cytoperm buffer, and intracellular cytokines were stained with Abs against IL-17, IFN-γ, or IL-6 (BD Biosciences). For phosphorylated STAT3 staining, cells were fixed with 2% paraformaldehyde for 10 min at 37°C, permeabilized with 90% methanol for 30 min on ice, and stained with pSTAT3 and CD4 mAbs (BD Biosciences). Foxp3 staining was carried out using a commercial kit, according to the manufacturer’s instructions (eBioscience, San Diego, CA). Flow-cytometric analysis was performed on BD FACSCalibur (BD Biosciences), and results were analyzed using FlowJo software (Tree Star, Ashland, OR). Splenocytes from BBR-treated and control EAE mice were cultured in the presence of MOG peptide (20 μg/ml) for 24 h. Cultured or fresh CD4+ or CD11b+ cells were isolated using a MicroBead Kit and LS columns (both from Miltenyi Biotec), per the manufacturer’s instructions. Cells were directly lysed in SDS sample buffer, and Western blot analysis was conducted as previously described (38). Abs were purchased from Cell Signaling Technology (Beverly, MA). Total RNA was isolated from cell pellets using RNeasy Mini Kit (Qiagen, Valencia, CA), and first-strand cDNA was subsequently synthesized using Sensiscript RT Kit (Qiagen), according to the manufacturer’s instructions. mRNA expression was determined by real-time PCR using SYBR Green Master Mix under standard thermocycler conditions (Applied Biosystems, Foster City, CA). Data were collected and quantitatively analyzed on an ABI Prism 7900 Sequence Detection System (Applied Biosystems). Mouse β-actin gene was used as endogenous control for sample normalization. Results were presented as fold increases relative to the expression of mouse β-actin. Sequences of PCR primer pairs were as follows: mouse β-actin, forward 5′-TGT CCA CCT TCC AGC AGA TGT-3′ and reverse 5′-AGC TCA GTA ACA GTC CGC CTA GA-3′; mouse RORγt, forward 5′-GGA GCT CTG CCA GAA TGA GC-3′ and reverse 5′-CAA GGC TCG AAA CAG CTC CAC-3′; mouse T-bet, forward 5′-AGC AAG GAC GGC GAA TGT T-3′ and reverse 5′-GGG TGG ACA TAT AAG CGG TTC-3′; mouse IL-12p40, forward 5′-CCA GGT GGA GTT CAA GAC CA-3′ and reverse 5′-TGT GGC ACA GTC TCA CTG TTG-3′; mouse IL-23p19, forward 5′-TGT GCC CCG TAT CCA GTG T-3′ and reverse 5′-CGG ATC CTT TGC AAG CAG AA-3′. The Student t test was used to analyze the differences between the groups. Where appropriate, one-way ANOVA was performed initially to determine whether an overall statistically significant change existed before a two-tailed paired or unpaired Student t test was carried out. A p value < 0.05 was considered statistically significant. The chemical form of BBR used in this study was BBR hydrochloride (Fig. 1A). It displayed little or no cytotoxicity toward primary mouse T cells in vitro at concentrations up to 5 μM (Fig. 1B). The treatment effect of BBR was first investigated in EAE. As illustrated in Fig. 2A (left panel), in a treatment protocol, BBR treatment (200 mg/kg/d) was initiated at the onset of EAE (day 9 postimmunization) and continued daily thereafter. The treatment regimen resulted in a significant reduction in disease severity, accompanied by markedly decreased inflammation and demyelination in affected spinal cord compared with that of vehicle control mice (Fig. 2A, 2B). BBR was equally efficacious in improving clinical score (Fig. 2A) and spinal cord histopathology when administered 3 d before immunization using a prevention protocol. It was evident that the therapeutic effect of BBR was associated with a marked reduction in the number of CNS-infiltrating MNCs in BBR-treated EAE mice compared with that of control mice (7.62 ± 0.44 × 105 and 13.1 ± 0.29 × 105, respectively; p < 0.05). Specifically, the percentages for CD4+ T cells and CD11b+ cells in the spleen and CNS of BBR-treated EAE mice were decreased compared with those of control EAE mice, whereas those for CD8+ T cells and B220+ B cells were not altered (Fig. 2C). When stimulated ex vivo, there was significantly decreased reactivity to the eliciting MOG peptide in CD4+ T cells derived from treated EAE mice, which correlated with reduced production of proinflammatory cytokines characteristic of EAE, including IFN-γ, IL-6, and IL-17, among a panel of Th1 and Th17 cytokines tested (Fig. 2D, 2E). The mRNA expression of IL-12 and IL-23 by CD11b+ cells was also decreased (Fig. 2F). Berberine. A, Chemical structure. B, Cell viability as measured by luminescence in splenocytes from EAE mice stimulated by MOG peptide ex vivo and cultured in the presence of increasing concentrations of BBR. *p < 0.05; **p < 0.01. Amelioration of EAE by BBR treatment. A, BBR (200 mg/kg) or vehicle control was administered intragastrically daily in EAE mice, started from day 9 (left panel) postimmunization or day 3 (right panel) before immunization. Data are expressed as mean clinical scores ± SEM (n = 10). B, Spinal cord sections obtained from BBR-treated or control EAE mice at day 18 postimmunization (treatment protocol) were analyzed for degree of demyelination by Luxol fast blue and for inflammation by H&E (original magnification ×200). Data presented are representative of two independent experiments. C, The percentage of CD4+, CD8+, or B220+ cells in the lymphocyte gate and that of CD11b+ cells in MNCs derived from spleen or CNS in BBR-treated or control EAE mice was analyzed by flow cytometry. D, Splenocytes were isolated from BBR-treated or control EAE mice at day 18 postimmunization and examined for proliferation in the presence of various concentrations of MOG35–55 peptide as measured by [3H]thymidine incorporation (mean ± SEM of triplicates). E, Supernatants derived from MOG35–55-reactive splenocytes, as above, were analyzed for the indicated cytokines. F, The same MOG35–55-reactive splenocyte preparations were analyzed for IL-12p40 and IL-23p19 mRNA expression by real-time PCR. Data are representative of three independent experiments. *p < 0.05; **p < 0.01. Consistent with the observed efficacy of BBR in EAE was a marked reduction in the percentages of Th1, Th17, and IL-6–producing CD11b+ cells by intracellular staining in spleen and CNS samples derived from treated EAE mice compared with those of control EAE mice, whereas the number of Foxp3+ Treg cells was not affected by BBR treatment (Fig. 3A). We first hypothesized that BBR exerted regulatory effects on Th1 and Th17 development through direct inhibition of the JAK/STAT pathway in T cells. To this end, splenic CD4+ T cells were purified from BBR-treated or control EAE mice and subjected to analysis of the key signaling molecules of the JAK/STAT pathway by immunoblot. As shown in Fig. 3B, consistent with the reduction in Th1 and Th17 cells was decreased expression of phosphorylated (p)-Tyk2, p-JAK1/2, p-STAT1 and p-STAT4 for Th1 cells and p-STAT3 for Th17 cells. The expression of the two key transcription factors, T-bet for Th1 and RORγt for Th17 cells, was significantly reduced in the same CD4+ T cell preparations derived from BBR-treated EAE mice (Fig. 3C). 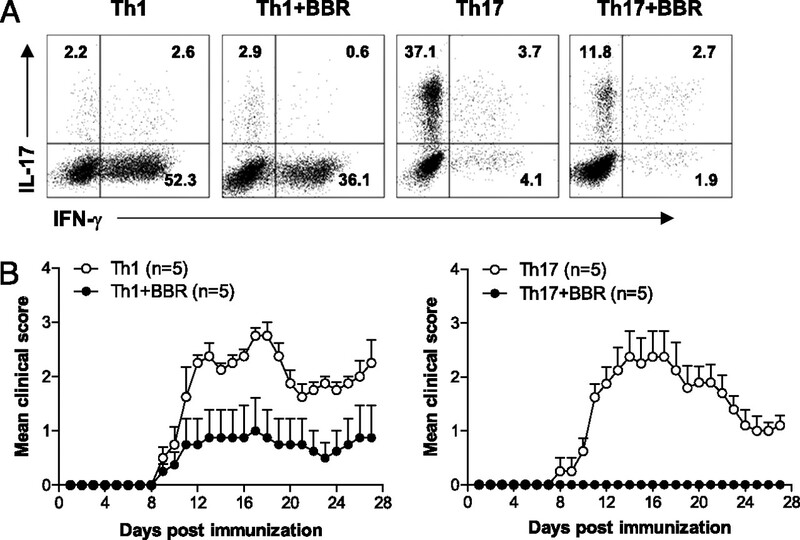 To further delineate whether the effect induced by BBR treatment was directed toward Th1 or Th17 cell differentiation, purified naive CD4+ T cells were cultured in the presence or absence of BBR in vitro under Th17- or Th1-polarizing conditions. Th17 cell differentiation was markedly inhibited by BBR treatment (23.75 ± 2.47% versus 4.55 ± 0.64%; p < 0.01), whereas Th1 cell differentiation was moderately affected (66.65 ± 4.88% versus 46.85 ± 2.19%; p < 0.05) (Fig. 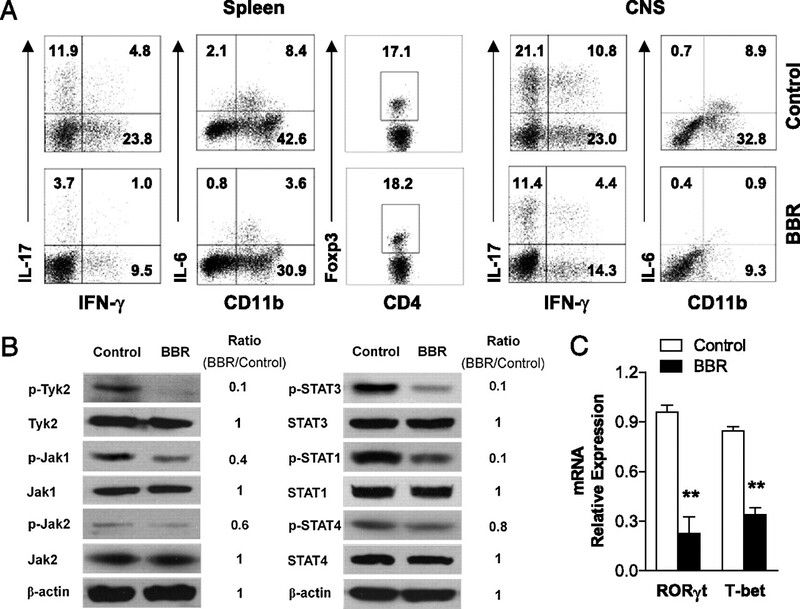 4A), which correlated with decreased phosphorylation of STAT3 and RORγt expression in Th17 cells and mildly reduced expression of p-STAT4 and T-bet in Th1 cells (Fig. 4B, 4C). Reduction of Th1 and Th17 cells by BBR through inhibition of the JAK/STAT pathway. A, The percentage of Th1/Th17 cells and regulatory T cells in the CD4 subset, as well as IL-6–secreting APCs, was analyzed by FACS through intracellular staining of IFN-γ, IL-17, Foxp3, and IL-6 in MNCs derived from spleen or CNS of BBR-treated or control EAE mice at day 18 postimmunization (treatment protocol), following restimulation with MOG35–55 peptide for 24 h. B, Splenocytes from BBR-treated or control EAE mice at day 18 postimmunization were restimulated with MOG35–55 peptide for 24 h. CD4+ T cell blasts were analyzed by immunoblotting for the expression or phosphorylation of indicated proteins in the JAK/STAT pathway. C, The same CD4+ T cell preparations were analyzed for the mRNA abundance of RORγt and T-bet by real-time PCR. Data are representative of three independent experiments with similar results. **p < 0.01. Role of BBR in Th1 and Th17 cell differentiation. Naive CD4+ cells were differentiated into Th1 or Th17 cells in the presence of different concentrations of BBR in vitro. A, The percentage of Th1 and Th17 cells in the CD4 subset was analyzed by intracellular staining of IFN-γ and IL-17, respectively. B, The phosphorylation of STAT3 and STAT4 in the aforementioned Th17 and Th1 cells was determined by flow cytometry. 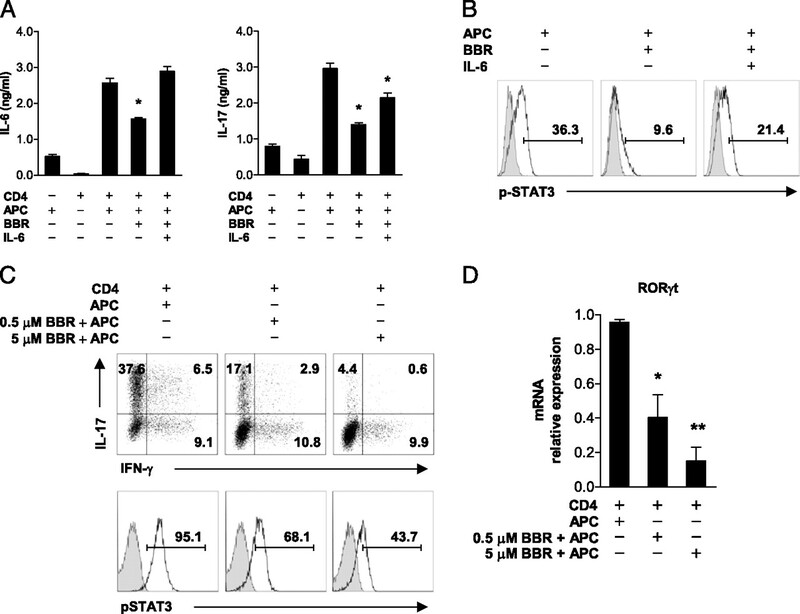 C, The mRNA abundance of RORγt and T-bet in these CD4+ T cells was analyzed by real-time PCR. Data are representative of two independent experiments. *p < 0.05. To further evaluate the functional consequences of BBR treatment on Th1 and Th17 cells in vivo, we prepared CD4+ T cells from 2D2 EAE mice under Th1- or Th17-polarizing conditions in the absence or presence of BBR treatment ex vivo (Fig. 5A) and subsequently transferred the resulting T cells into naive recipient mice. As shown in Fig. 5B, MOG35–55-reactive T cells of the Th17 and Th1 phenotype induced EAE in recipient mice. BBR treatment completely abolished the encephalitogenicity of Th17 cells, whereas the same treatment partially inhibited the ability of Th1 cells to induce EAE. The data collectively demonstrate that BBR directly inhibited Th1 and Th17 differentiation and function through the JAK/STAT pathway. Role of BBR in Th1 and Th17 cell function. A, Purified CD4+ splenocytes were derived from 2D2 EAE mice at day 12 postimmunization and polarized in Th1 or Th17 conditions in the presence or absence of BBR for 3 d. The resulting cells were analyzed for the percentage of Th1 and Th17 cells by flow cytometry. B, These T cell populations were adoptively transferred into lightly irradiated (400 rad) C57BL/6 recipients (6 × 106 per mouse). Mice were observed daily for EAE severity. Data are expressed as mean clinical scores ± SEM (n = 5). We further addressed the possibility that the efficacy of BBR treatment was attributable, in part, to altered function of CD11b+ APCs, thus indirectly affecting the encephalitogenicity of Th1 and Th17 cell responses. To this end, we first examined NF-κB activity, because it is critically involved in the function of APCs through the production of proinflammatory cytokines (e.g., IL-6 and IL-1β) and the expression of costimulatory molecules. Our results revealed that treatment of CD11b+ cells with BBR in EAE mice led to markedly reduced activity of NF-κB, which was accompanied by the increased expression of IκBα and decreased phosphorylation of IκBα compared with that of control EAE mice (Fig. 6A). Similar results were obtained with CD11b+ cells derived from EAE mice and treated ex vivo with BBR (Fig. 6B). 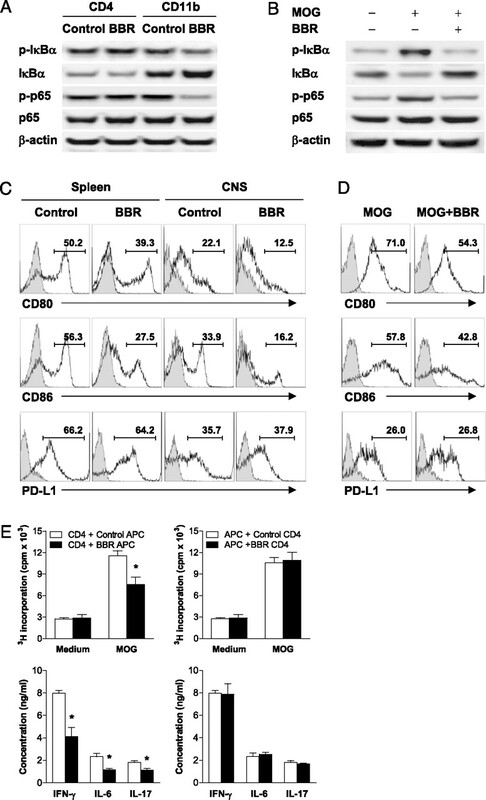 Impairment of Ag presentation and decreased IL-6 production in CD11b+ cells by BBR through dampened NF-κB signaling. A, CD4+ and CD11b+ splenocytes were collected from BBR-treated or control EAE mice at day 18 post immunization and analyzed for phosphorylated and total IκB and p65 levels by immunoblotting. B, Splenocytes from EAE mice were treated or not with 5 μM BBR for 2 h in the presence or absence of MOG peptide, and CD11b+ cells were sorted and analyzed for phosphorylated and total IκB and p65 levels by immunoblotting. C, MNCs from spleen and CNS of BBR-treated or control EAE mice at day 18 postimmunization were stimulated with MOG35–55 peptide and analyzed for PD-L1, CD80, and CD86 expression by flow cytometry in the CD11b+ cell population. D, Splenocytes isolated from EAE mice were stimulated with the MOG35–55 peptide in the presence or absence of 5 μM BBR and then analyzed for expression of PD-L1, CD80, and CD86 by flow cytometry in the CD11b+ cell population. Data are representative of two independent experiments. E, CD4+ splenocytes isolated from EAE mice at day 18 postimmunization were cultured with CD11b+ APCs derived from BBR-treated or control EAE mice and examined for proliferation in the presence of MOG35–55 peptide, as measured by [3H]thymidine incorporation (mean ± SEM of triplicates, left panel). CD4+ splenocytes derived from BBR-treated or control EAE mice were cultured with CD11b+ APCs isolated from EAE mice and examined for proliferation by [3H]thymidine incorporation (mean ± SEM of triplicates, right panel). Cytokine productions of the aforementioned cultures were analyzed by ELISA. Data are representative of two independent experiments. *p < 0.05. We then assessed whether the inhibition of NF-κB led to changes in the expression and production of downstream costimulatory molecules in APCs and key proinflammatory cytokines that are known to affect Th1 and Th17 differentiation and whether such changes could affect encephalitogenic T cell responses. To this end, mononuclear cells derived from spleen and spinal cord of BBR-treated EAE mice or control mice were analyzed ex vivo for the expression of a panel of costimulatory molecules, including CD28, ICOS, CTLA-4, PD-1, CD80, CD86, and PD-L1. As shown in Fig. 6C, the surface expression of CD80 and CD86 was selectively decreased in CD11b+ APCs derived from spleen and CNS of BBR-treated EAE mice, whereas the expression of costimulatory molecules on CD4+ T cells was not altered by BBR treatment (data not shown). The same was seen in CD11b+ cells that were derived from EAE mice and treated ex vivo with BBR (Fig. 6D). Furthermore, as shown in Fig. 6E, the T cell reactivity to MOG was significantly dampened when purified CD4+ MOG-reactive T cells were cocultured with APCs derived from BBR-treated EAE mice compared with those of controls. The observed effect of BBR on CD11b+ cells was associated with reduced production of IL-17, IFN-γ, and IL-6 in supernatant of MOG-reactive T cell culture. Next, we examined whether the decreased production of IL-6 in CD11b+ cells would affect Th17 cell differentiation. For this purpose, CD11b+ APCs isolated from MOG-EAE mice were pretreated in vitro with BBR and cocultured with purified CD4+ MOG-reactive T cells in the context of Th17 differentiation. BBR treatment led to significant inhibition of IL-6 and IL-17 production by APCs and CD4+ T cells, respectively (Fig. 7A). This correlated with a marked reduction in STAT3 phosphorylation in CD4+ T cells (Fig. 7B). In contrast, the observed effect of BBR on CD11b+ APCs could be partially overcome by the addition of IL-6, suggesting the modulatory effect of BBR on Th17 cells is mediated, at least in part, by IL-6. Moreover, the effect of BBR-treated CD11b+ cells on Th17 differentiation was determined by coculture of naive CD4+ T cells with CD11b+ APCs treated with BBR under Th17-polarizing conditions. As shown in Fig. 7C and 7D, Th17 cell differentiation was significantly inhibited in a dose-dependent manner under the conditions described above. Decreased IL-6 production by CD11b+ cells by BBR treatment and inhibition of Th17 cells. A, CD11b+ cells isolated from EAE mice were pretreated or not with 5 μM BBR and cocultured with CD4+ MOG35–55-reactive T cells. Where indicated, IL-6 (1 ng/ml) was added. Cytokine production from the cultures was analyzed by ELISA. B, The phosphorylation of STAT3 in the aforementioned CD4+ T cells was analyzed by flow cytometry. C, Naive CD4+ cells were cocultured with CD11b+ APCs from naive mice pretreated or not with 5 μM BBR under Th17-polarizing conditions. The percentage of Th17 cells and STAT3 phosphorylation in the CD4 subset was analyzed by intracellular staining of IL-17 and pSTAT3, respectively. D, The mRNA abundance of RORγt in CD4+ cells was analyzed by real-time PCR. Data are representative of two independent experiments. *p < 0.05; **p < 0.01. Collectively, the findings indicate that CD11b+ APCs contribute to the efficacy of BBR treatment through its regulatory properties on altered NF-κB activity and subsequent Th1 and Th17 differentiation and function by decreased production of IL-6 and expression of costimulatory molecules in CD11b+ cells. BBR was reported to affect cellular functions through regulation of various MAPK signaling pathways in cell types such as hepatocytes and endothelial cells (39, 40); however, its role in the immune system and, more specifically, in the differentiation and function of various Th cell subsets in an autoimmune disease setting is elusive. In this study, we showed that BBR can regulate the differentiation and activity of Th17 and, to a lesser degree, Th1 cells without affecting regulatory T cells. This was first demonstrated by diminished Th1/Th17 response in EAE mice treated with BBR and further substantiated by adoptive-transfer experiments showing the loss of encephalitogenicity in BBR-treated MOG-specific Th17 cells. The selectivity of BBR for pathogenic Th1 and Th17 cells, while sparing Treg cells that rely on different signaling pathway(s) for differentiation, is conferred by its effect on the JAK/STAT signaling pathway. In this way, BBR downregulates STAT3 phosphorylation and RORγt expression in differentiating Th17 cells and reduces STAT4 and STAT1 phosphorylation and T-bet expression during Th1 differentiation. It is conceivable that the relative susceptibility of Th17 cells over Th1 cells is attributable to the differences in attenuating STAT3 versus STAT4 signals. To our knowledge, this is the first demonstration that BBR regulates T cell differentiation and function through the JAK/STAT pathway. It is worth mentioning that BBR is known to regulate glucose handling and lipid metabolism in hepatocytes and adipocytes (36, 40, 41). Given that STAT3 is a key transcription factor in these processes (42, 43) and our novel findings of BBR regulation of STAT3, it raises the possibility that BBR regulates metabolism through the JAK/STAT3 cascade, which may provide new therapeutic avenues to regulate glucose and lipid homeostasis. Another important aspect of the study is related to the conclusion that the full extent of the immunomodulatory effects of BBR requires involvement of APCs. First, BBR was found to impair APC function through reduced IκB and p65 phosphorylation and, hence, NF-κB activation, which correlates with downregulation of costimulatory molecules, such as CD80 and CD86 (27). As a result, BBR treatment is expected to significantly affect T cell activation. Second, BBR suppressed IL-6 production and mRNA expression of IL-12p40 and IL-23p19 by APCs. It was evident in this study that the effect of BBR on Th17 cells is dependent, in part, on APC-derived IL-6, because the inhibition of Th17 cells could be overcome by IL-6 supplementation. The finding related to the IL-6–reducing effect of BBR is consistent with other reports that BBR treatment results in decreased expression of IL-6 in macrophages (44) and that reduced serum IL-6 levels were found in individuals treated with BBR in controlled clinical trials (36). Decreasing IL-6 mRNA stability through regulation of RNA-binding proteins has been entertained as a possible mechanism (44). By separating the effect of APCs from that of T cells in relation to BBR treatment, we are able to delineate the important contribution of APCs to the attenuated Th17 and Th1 cell responses seen in ex vivo analyses. This provides an elegant example of how synergistic actions are required for a treatment agent to be efficacious in autoimmune diseases involving highly complex inflammatory processes. Such a broad, but nuanced, regulation on Th1 cells, Th17 cells, and APCs is also illustrated by EP4, a receptor for PGE2 that is expressed on dendritic cells and T cells (45, 46). EP4 agonism promotes Th1 differentiation through the PI3K pathway, and it can amplify IL-23–mediated Th17 expansion by upregulating IL-23 in dendritic cells and IL-23R on T cells. A selective EP4 antagonist decreased Th1 and Th17 cells in vivo and suppressed EAE (46). Given that multiple immune cell types are implicated in MS/EAE and other autoimmune pathologies and our growing understanding of how Th1 and Th17 subsets play important and distinct roles, it becomes clear that agents such as BBR and EP4 antagonists that possess synergistic properties in the inhibition of pathogenic T cell subsets hold promise for effectively controlling autoimmune pathologies. It is important to note that BBR is not a cytotoxic or general immunosuppressive agent that affects T cell survival or activation, as is the case for some natural product components, such as triptolide (47). This attribute is likely to provide a better safety profile. Novel biological mechanisms and pharmacological targets continue to be identified through analysis of the chemical biology of natural/herbal compounds and derivatives. For example, FTY720, a derivative of myriocin, which is a natural product isolated from the Chinese herb, Cordyceps sinensis, shut down lymphocyte trafficking out of lymphoid organs by targeting sphingosine 1-phosphate receptor type 1 (48). A recent review estimated that 51% of all small-molecule new chemical entities approved in the past 25 y are natural compounds or derivatives and mimics (49). Indeed, natural product compounds will continue to be a treasure trove for new drug development for the foreseeable future. It should be appreciated that autoimmune diseases often involve the breakdown of multiple regulatory pathways. It follows that anti-inflammatory drugs obtained through a single-target–based drug-discovery process may be unlikely to achieve adequate efficacy in the treatment of autoimmune conditions. In comparison, compounds from traditional Chinese medicine that target distinct immune/inflammation pathways may be more successful at reining in the immune system. One such example is SM933, an artemisinin derivative that was shown to target the NF-κB and IFN-α/Rig-G/JAB-1 pathways to control EAE inflammation (50). Likewise, the novel anti-inflammatory properties of BBR that we uncovered through EAE and mechanistic studies raise the possibility of using it as a starting point for the development of pathways-based immunomodulatory therapeutics. This work was supported by Grants NSF-30430650 and NSF-30571731 from the National Natural Science Foundation of China and by Grant 04DZ14902 from the Shanghai Commission of Science and Technology.
. 2007. Multiple sclerosis: a complicated picture of autoimmunity. Nat. Immunol. 8: 913–919.
. 1999. Interleukin-17 mRNA expression in blood and CSF mononuclear cells is augmented in multiple sclerosis. Mult. Scler. 5: 101–104.
. 2008. Interleukin-17 production in central nervous system-infiltrating T cells and glial cells is associated with active disease in multiple sclerosis. Am. J. Pathol. 172: 146–155.
. 2008. IL-12- and IL-23-modulated T cells induce distinct types of EAE based on histology, CNS chemokine profile, and response to cytokine inhibition. J. Exp. Med. 205: 1535–1541.
. 2007. T(H)-17 cells in the circle of immunity and autoimmunity. Nat. Immunol. 8: 345–350.
. 2008. IL-6 blockade inhibits the induction of myelin antigen-specific Th17 cells and Th1 cells in experimental autoimmune encephalomyelitis. Proc. Natl. Acad. Sci. USA 105: 9041–9046.
. 2007. Anti-IL-17A autovaccination prevents clinical and histological manifestations of experimental autoimmune encephalomyelitis. Ann. N. Y. Acad. Sci. 1110: 330–336.
. 2006. Development of an anti-IL-17A auto-vaccine that prevents experimental auto-immune encephalomyelitis. Eur. J. Immunol. 36: 2868–2874.
. 2002. The lineage decisions of helper T cells. Nat. Rev. Immunol. 2: 933–944.
. 1996. Impaired IL-12 responses and enhanced development of Th2 cells in Stat4-deficient mice. Nature 382: 174–177.
. 1996. Requirement for Stat4 in interleukin-12-mediated responses of natural killer and T cells. Nature 382: 171–174.
. 2008. Loss of STAT3 in CD4+ T cells prevents development of experimental autoimmune diseases. J. Immunol. 180: 6070–6076.
. 2007. Stat3 and Stat4 direct development of IL-17-secreting Th cells. J. Immunol. 178: 4901–4907.
. 2006. Aberrant regulation of synovial T cell activation by soluble costimulatory molecules in rheumatoid arthritis. J. Immunol. 177: 8844–8850.
. 2008. Distinct in vivo roles of CD80 and CD86 in the effector T-cell responses inducing antigen-induced arthritis. Immunology 124: 503–513.
. 2007. APC-derived cytokines and T cell polarization in autoimmune inflammation. J. Clin. Invest. 117: 1119–1127.
. 2007. New therapeutic approaches for multiple sclerosis. Annu. Rev. Med. 58: 417–432.
. 2008. Pharmacological and therapeutic effects of Berberis vulgaris and its active constituent, berberine. Phytother. Res. 22: 999–1012.
. 2002. A comparative study on the anti-inflammatory, antinociceptive and antipyretic effects of isoquinoline alkaloids from the roots of Turkish Berberis species. Life Sci. 72: 645–657.
. 2009. Berberine reduces insulin resistance through protein kinase C-dependent up-regulation of insulin receptor expression. Metabolism 58: 109–119.
. 1986. Berberine sulfate inhibits tumor-promoting activity of teleocidin in two-stage carcinogenesis on mouse skin. Oncology 43: 131–134.
. 1987. Randomized controlled trial of berberine sulfate therapy for diarrhea due to enterotoxigenic Escherichia coli and Vibrio cholerae. J. Infect. Dis. 155: 979–984.
. 2008. Treatment of type 2 diabetes and dyslipidemia with the natural plant alkaloid berberine. J. Clin. Endocrinol. Metab. 93: 2559–2565.
. 2009. Berberine differentially modulates the activities of ERK, p38 MAPK, and JNK to suppress Th17 and Th1 T cell differentiation in type 1 diabetic mice. J. Biol. Chem. 284: 28420–28429.
. 2008. Novel immunomodulatory properties of berbamine through selective down-regulation of STAT4 and action of IFN-gamma in experimental autoimmune encephalomyelitis. J. Immunol. 181: 1491–1498.
. 2009. The combination of berberine and irradiation enhances anti-cancer effects via activation of p38 MAPK pathway and ROS generation in human hepatoma cells. J. Cell. Biochem. 107: 955–964.
. 2004. Berberine is a novel cholesterol-lowering drug working through a unique mechanism distinct from statins. Nat. Med. 10: 1344–1351.
. 2006. Berberine inhibits 3T3-L1 adipocyte differentiation through the PPARgamma pathway. Biochem. Biophys. Res. Commun. 348: 571–578.
. 2010. Signal transducer and activator of transcription 3 (STAT3) regulates adipocyte differentiation via peroxisome-proliferator-activated receptor gamma (PPARgamma). Biol. Cell 102: 1–12.
. 2009. STAT3 inhibition of gluconeogenesis is downregulated by SirT1. Nat. Cell Biol. 11: 492–500.
. 2010. Berberine inhibits HIV protease inhibitor-induced inflammatory response by modulating ER stress signaling pathways in murine macrophages. PLoS ONE 5: e9069.
. 2009. Prostaglandin E2-EP4 signaling promotes immune inflammation through Th1 cell differentiation and Th17 cell expansion. Nat. Med. 15: 633–640.
. 2003. Immunosuppressive and anti-inflammatory mechanisms of triptolide, the principal active diterpenoid from the Chinese medicinal herb Tripterygium wilfordii Hook. f. Drugs R D. 4: 1–18.
. 2006. Fingolimod and sphingosine-1-phosphate—modifiers of lymphocyte migration. N. Engl. J. Med. 355: 1088–1091.
. 2007. Natural products as sources of new drugs over the last 25 years. J. Nat. Prod. 70: 461–477.
. 2007. Anti-inflammatory properties and regulatory mechanism of a novel derivative of artemisinin in experimental autoimmune encephalomyelitis. J. Immunol. 179: 5958–5965.